Baby Gold turnips are composed of young edible roots, stems and leaves. Each individual root is attached to two to three semi-frilled green stems with broad, textured leaves. The roots are globular and come to a long thin tapered point. Gold turnips have a pale straw to cornflower yellow hue. The fresh flesh of the Gold turnip is firm and crunchy. The flavor is slightly earthy and exceptionally sweet, with peppery undertones reminiscent of a radish. Baby Gold turnips are available year-round with a peak season October through March. Baby Gold turnips, Brassica rapa var. 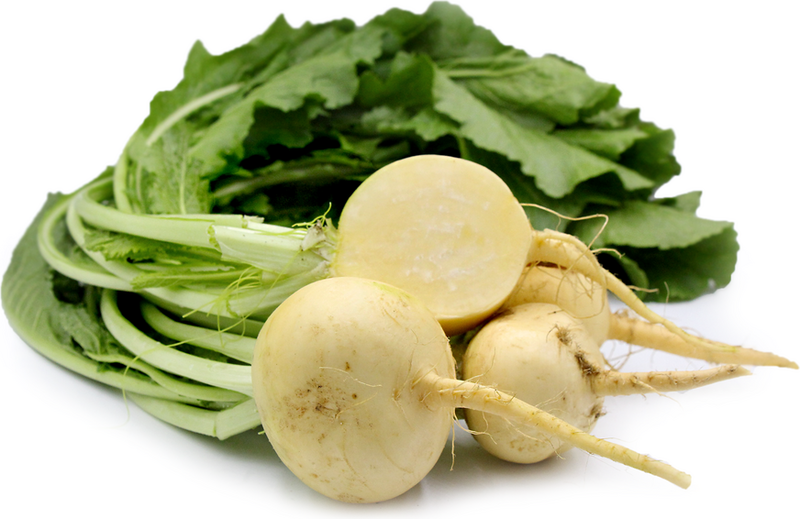 rapa, are the type of turnip that should be harvested young. They are not considered a tradition cellar vegetable as they will not maintain their firmness and flavor while being stored throughout the winter, which common turnips as well and the turnip's parent, the rutabaga are often utilized for. They are several varieties of Gold turnips, marketed under names such as Golden Globe, Golden Ball and perhaps the most regaled variety, Boule D'or. Baby Gold turnips can be found in classic savory recipes reflective of the seasons, Fall and Winter. Fresh Baby Gold turnips can be eaten whole or sliced; their flavor and texture complimenting crudités and salad greens with both vinaigrette and creamy style dressings. The Gold turnip can be cooked utilizing methods such as boiling, steaming and frying. The flavor is truly transformed and sweetened when it is slow roasted, braised or sautéed in butter. Once turnips are cooked, they can be utilized to pair with meats, they make a great addition to roasted vegetable medleys and they can become purées or soups. Baby Golden turnips pair well with apples, bacon, butter, cheeses such as Parmesan and Pecorino, chives, cream, chicken, lamb, pork, garlic, lemon, parsley, potatoes, tarragon, thyme and vinegar. Turnip greens can be blanched, sautéed or used fresh as a bitter and textural green in salads. The domesticated turnip's origins are traced as far back as the Hellenistic Period of Greek civilization (approximately 300 BCE). Its horticultural relevance pre-dates the arrival of the potato. Historically the turnip has had dual purpose as a crop for both humans and animals. Baby Gold turnip varieties are heirloom varieties with European origins, just like the common turnip. The Golden turnip was first cultivated in France in the 1800's. Turnips are a Fall and Spring crop as they cannot tolerate hot soil or the roots will boil and their greens will burn. Recipes that include Baby Gold Turnips. One is easiest, three is harder.